It is easy to get lost in the weeds when choosing between electric and pneumatic actuators for quarter turn valves. 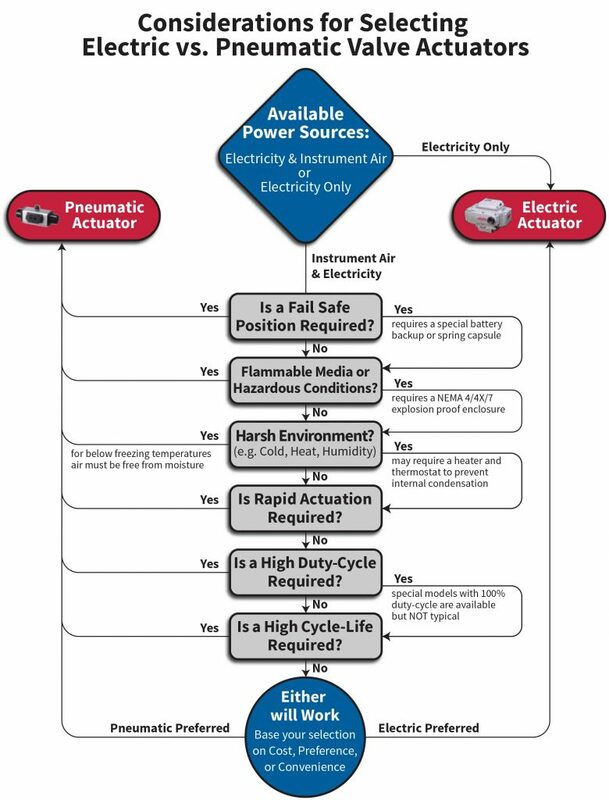 Brian Booth, Assured Automation’s Vice President of Sales and Product Manager for thermal and remote shutoffs, recommends using the simple decision tree below when choosing which actuator is best for your application. Is a Fail Safe Position Required? Flammable Media or Hazardous Conditions? Is a High Duty-Cycle Required? Is a High Cycle-Life Required? This simple decision tree makes it very easy and quick to determine which type of actuation is preferred for your particular application. By following the logic tree, you can narrow down the correct options, as well as be alerted to any additional requirements. For many years, pneumatic actuators dominated process plants. Pneumatic actuators are powered by compressed air and are frequently used in both isolation (on/off), and in modulating control applications. Despite new electric actuator technologies and growing usage, the pneumatic actuator still maintains its fair share in chemical processing, food and beverage, and oil and gas facilities, due to their durability, simplicity, speed and size. Failure mode requirements may make pneumatic actuators preferred over electric. Electric actuators with spring-return failure position are typically much more expensive than pneumatic actuators. Pneumatic actuators are easily adaptable in hazardous environments with properly rated accessories. Most pneumatic actuators can be serviced by onsite maintenance staff due to their simple design, another advantage over electric actuators. Electric actuators have been traditionally preferred for when precision control and positioning is required as well as for remote locations where instrument air is not available. Electric actuators tend to be more expensive to purchase than pneumatic actuators initially, but operating costs are less over the long term. We would love to hear your feedback on the decision tree, and how it may have helped you in designing your industrial process. This entry was posted in Installation and Training, Latest News and tagged Actuated Butterfly Valves, Automated Valves, Electric Actuators, pneumatic vs electric actuators, Pneumatically Actuated Valves, Valve Actuators. Bookmark the permalink.